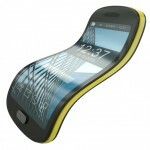 Bendable Batteries: Technology of the Future? This entry was posted on November 6, 2013 by Avel Ureno. Shortly after LG Electronics announced that it would be releasing the world’s first vertically curved phone in its Asian markets, both the Daily Mail and CNET News reported that the manufacturer is developing bendable batteries to be used in their future, highly anticipated mobile devices. While LG’s bendable display screens stole the headlines in the first week of October, the company’s bendable batteries may have even greater implications for the future of mobile technology. LG’s vertically curved smartphone, the Flex, was just released on October 28, 2013, to compete with Samsung’s Galaxy Round smartphone, which is horizontally curved. However, it now appears that LG’s choice in titling its new product has provided the world with a glimpse into the company’s research and development (R&D) strategy. Despite its name, the LG Flex is not flexible. It is just as solid and unbendable as every other phone on the market, but it is the first step in the development of other flexible technologies, including display screens and bendable batteries. In the first week of October 2013, LG made two major announcements. One was about the development of a flexible OLED display for mobile devices, which received a lot of attention from the media. Although LG developed a bendable display back in 2010, it was never commercially released because it was deemed too expensive for the consumer market. Now, however, the technology has evolved and dropped in price, making it a practical option for the design of new mobile devices, especially when combined with the new battery technology that was announced alongside the flexible displays. The biggest and most promising news about LG’s development of flexible mobile technology is the announcement of three new types of batteries that are either bendable or modifiable: curved batteries, stepped batteries and cable batteries. In the coming years, these batteries will be essential in the production of flexible mobile devices. The first of the new batteries is the curved battery. This battery is not truly bendable but is rigid like all other batteries. However, LG’s new stack-and-fold technology allows them to be molded into curved shapes to complement curved screens and form factors. The second new battery from LG is the stepped battery. The stepped battery is actually two or more batteries that have been joined together like steps. This allows the battery to fit into tight or irregular spaces that could not house standard, rectangular batteries, and the design allows for a 16 percent increase in storage capacity. LG’s truly flexible battery is the cable battery, which is so bendable that it can be tied into a knot and still function at peak capacity. In addition, the cable battery is waterproof and never overheats, making it ideal for use in wearable gadgets, such as smartphone watches. Another great benefit of bendable batteries is that they are difficult to break because they adjust to body movements and absorb impact. When the LG cable battery is finally released to the public, it may very well change mobile technology as we know it today.